The evolution of the mobile workplace and Business Rugged Computing combine to bring you the Havis Docking Station for the Panasonic Toughbook 53. 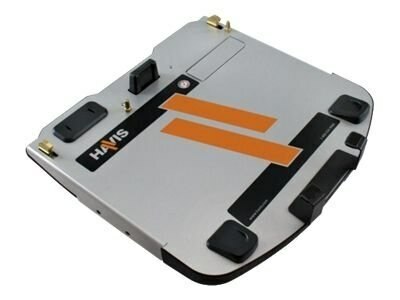 Building on our reputation as a designer of the industry’s best mobile computing solutions - Havis has developed a lightweight and strong design that is built with theft deterrence, longevity and stability in mind. The only Toughbook Certified docking station for Panasonic Toughbook CF-53 laptop computers. Cradle-only version with no Electronics gives you a safe and secure mounting option for your computer inside your mobile workplace. Low profile design maximizes available space inside of vehicle. Rounded corners and edges are ideal for your safety in accidents and airbag deployment, in addition to daily use and operation of docking station. Supplied mounting bracket designed to fit all Havis mounting equipment, VESA standards, and most competitors mounting equipment. Locator pins and front foot pads help guide your computer into the docking station, ensuring proper alignment and docking connectivity. Easy to use latching handle makes certain your computer is safe and secure inside your vehicle. Lock and key supplied for peace of mind theft deterrence. Power supply LPS-103 sold separately.